Be the first to review this 2019 Acura RDX. 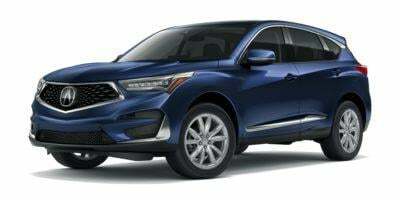 The Acura RDX compact crossover has been renewed for the 2019 model year, with a fresh face, an improved cabin, and a new turbocharged engine. In styling, performance, and prestige, the next-generation RDX has turned into a stronger competitor. The wheelbase of the new RDX has been lengthened by 2.6 inches. That move alone eradicates previous complaints of skimpy back-seat legroom. Base, Technology, A-Spec, and Advance trim levels are offered, though the latter three are essentially option packages. In a quest for stronger performance, Acura adopted a turbocharged 4-cylinder engine from the Honda Civic Type R. Cranking out 272 horsepower and 280 pound-feet of torque, the 2.0-liter turbo-4 mates with a 10-speed automatic transmission that runs through the gears in virtual silence. When appropriate, the transmission can drop down by as many as four speeds. Paddle shifters lend it videogame-like control, and the automatic transmission behaves well enough without manual gear changes. Front-wheel drive is standard. All-wheel drive costs an additional $2,000 on any model. The energetic new engine delivers 40 percent more low-end torque than the RDX’s previous V-6. Each 2019 RDX is equipped with contemporary safety features, including automatic emergency braking. Also standard are forward-collision warnings, adaptive cruise control, and active lane control. All but the base RDX get blind-spot monitors, but only the Advance Package incorporates a surround-view camera system. Federal crash-testing yielded a strong result, and the 2019 RDX scored well in independent testing. The Insurance Institute for Highway Safety gave RDX “Good” ratings in each category, including the small-overlap test for both front passengers. The RDX was deemed “Superior” for frontal crash prevention. Meanwhile, the National Highway Traffic Safety Administration gave the 2019 RDX five stars overall and for the side-impact crash, but only a four-star score for frontal-impact protection. Rollover prevention (a calculated figure) also rated four stars, which is typical for crossovers. The base RDX ($37,400 with front-drive, $39,400 with all-wheel drive) comes with a panoramic moonroof, synthetic leather upholstery, 12-way heated front seats, LED headlights, and 19-inch alloy wheels. Nine-speaker infotainment includes a 10.2-inch display and Apple CarPlay capability. The RDX w/Technology Package ($40,600 with FWD, $42,600 with AWD) includes perforated leather upholstery, parking sensors, navigation, and 12-speaker audio. The RDX w/A-Spec Package ($43,600 with FWD, $45,600 with AWD) adds sueded sport seats with black or red/black leather, cooled front seats, blacked-out exterior trim, 16-speaker audio, and 20-inch wheels. The RDX w/Advance Package ($45,500 with FWD, $47,500 with AWD) comes with a head-up display, a surround-view camera system, 16-way power front seats, heated rear seats and steering wheel, and driver-adjustable shock absorbers. With its 2019 reworking, the RDX has adopted a handsome new look that has transformed it into a sleek crossover that sits lower and wider than before. Up front, the pentagonal grille frames a huge badge in diamond-shaped cutouts. Deep lines direct air around big LED headlights. Black plastic pillar trim makes the roof almost appear to float. On the A-Spec version, black trim takes the place of the usual bright metal. Acura has transformed the RDX with a high-end interior. Especially on top models, it blends elements of wood, leather, brushed aluminum, and stainless steel. Arguably, it flaunts the ritziest cabin of any Acura crossover. Base models rely on synthetic leather with metallic trim, though each version contains gloss black plastic. A-Spec variants exhibit a more technical look. At the apex, Advance trim dresses in nappa leather with olive ash wood. Transmission controls give the center stack an inefficient shape, but the overall tone of graceful luxury rules the dash. Interior space is closer to the RDX’s German rivals now. Base-model seats adjust a dozen ways, giving occupants a relatively high, commanding position with fine support. The back seats could use more leg support, but space is good for 6-foot-tall passengers. Acura’s new infotainment system operates through a console touchpad. Voice commands on most models understand natural speech. However, the system does not yet support Android Auto. The audio system delivers clean, sublime sound. Storage space abounds, starting with 29.5 cubic feet of space behind rear seats. Folding them flat expands volume to 58.9 cubic feet. Adding a bit of space, Acura moved the spare tire underneath the car. Billed as the company’s sportiest compact crossover yet, the 2019 RDX vies against such premium rivals as the BMW X3 and Audi Q5. Though less firmly suspended than those models, the RDX yields a refined, mellow demeanor ΓÇô far from the jitteriness of its predecessor. The powerful new turbo-4 engine emits some gusty sounds as it accelerates. Reaching 60 mph has been estimated to take around 7 seconds. Weight is about average for its class. Absorbing bumps effectively, the RDX delivers a composed, pliant ride. Even the base-model suspension yields little more than gentle thumps while traversing pavement seams and potholes. Handling is another highlight, especially on models with driver-selectable shock absorbers. Increasing rear track width by 1.3 inches helps, as do larger (19- or 20-inch) tires. Relaxed roadholding inspires confidence; the RDX never feels high-strung. Integrated Dynamics Control offers Comfort, Sport, and Sport+ modes for driving. Electric power steering helps the RDX track well over rough pavement. Fuel economy is near average for the class. With front-wheel drive, the base RDX is EPA-rated at 22/28 mpg City/highway, or 24 mpg Combined. An all-wheel-drive A-Spec model is EPA-rated at 21/26 mpg City/Highway, or 23 mpg Combined. Premium gasoline is recommended. The 2019 Acura RDX is a bargain among luxury compact crossovers. Base models are amply-equipped, but the best features are limited to the costly Advance edition. In addition to an above-average powertrain, the 2019 RDX delivers an appealing blend of ride and handling and style.